Join host, Robert Forto as he welcomes dog musher, Brenda Mackey to Mushing Radio. 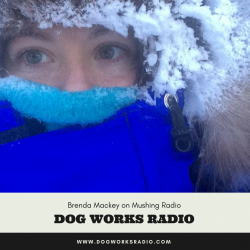 Mackey has been a dog musher since she was a little kid and grew up in a famous mushing family. We get a chance to talk to her about how she got started in the sport and what she is doing today. Brenda spent the majority of her childhood years in the “bush” outside of Trapper Creek, Alaska where her parents, Rick and Patti Mackey, owned and operated Mackey’s Happy Dog Kennel. She entered and won her first dog race at three year’s old, racing in the one-dog class. Rick primarily supported the family through race winnings and dog sales. Chasing a longer mushing season and more manageable annual snowfall, the family moved north to Nenana, Alaska in 1990. Throughout high school Brenda chose to homeschool in order to devote as much time to the family dog kennel as possible, following her passion. By the age of 14 she was responsible for training the kennel’s yearling team, booking and guiding spring tours, the endless list of kennel chores, and helping her dad train for his major races like the Iditarod and Yukon Quest. At the age of 19 she became one of the youngest women to complete the 1000-mile Yukon Quest International Sled Dog Race. In 1999 Brenda was given the title of Youth Ambassador for the Yukon Quest and traveled to Spain and France to speak about the race. Brenda graduated with honors from the University of AK Fairbanks with a B.A. in both psychology and Sociology in 2007. How did you get started in the world of sled dogs? Lets talk about your family’s legacy a bit. What races have you competed in or plan on competing in this year? We talk in-depth about her breeding program and training goals.